Recurring Deposits (RD) are a great way to deposit bit by bit and yield a high amount on maturity. A very popular tool for those who cannot use the entire savings but a few thousands in order to get a high amount back on maturity. The interest charged on these deposits is similar to the ones on fixed deposits. Personally, even if you shell out Rs. 100 every month then it can get you a higher returns later. 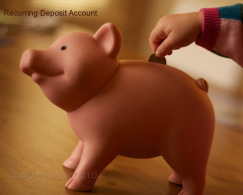 The recurring deposit starts with INR 100 in banks, INR 10 with post Office and maximum limit can be any.Non Resident Indians (NRIs)are not allowed to have such account with Post Office. Hence they can open NRI account with a bank and then open RD account linked to it.One should remember that there is a default fee with certain banks in case you fail to deposit the amount . So, how do you chose a bank where you want to open RD? Well, it is close to choosing a bank you want to open a Fixed Deposit with but this one comes with certain rules. Usually bank charges a fee in case you default on your payment. It allows a certain period for revival of your account.In case you continue to default the account is discontinued. In such cases your current interest rate applicable on RD will cease to exist due to premature withdrawal of account. This time is the best time to open RD because you need to lock your small savings till markets do not pick up.The advantage here is that a huge sum(unlike Fixed Deposit) is not locked for a certain period. For RD account some banks can be very stringent and may charge for early closure.Four defaults are usually pardoned ,however, on the fifth you would have to close your account. The tenure once fixed for RD can never be changed later. Also the fixed amount remains the same and cannot be split into two installments in a month even on request. Banks usually do not allow early withdrawal of the account for 3 years but for post office it is one year.These rules depends from bank to bank. Hence a careful study of which bank you need to deal with becomes important.A loan is also can be availed on this account and later a lump sum can be paid back to the bank.As far as taxation implications goes, one should remember that the interest earned is taxable but not deducted at source. It will be treated as Interest Income and will be added to your income and deducted within the slab range you come in. Basically, RD is meant for safe investors who are risk averse.have a capacity to save and whose range of investment is low. What you need to keep in mind is that the bank you are dealing with has flexible policies in case you default, no penalty charges on early closure or gives a low rate of interest.